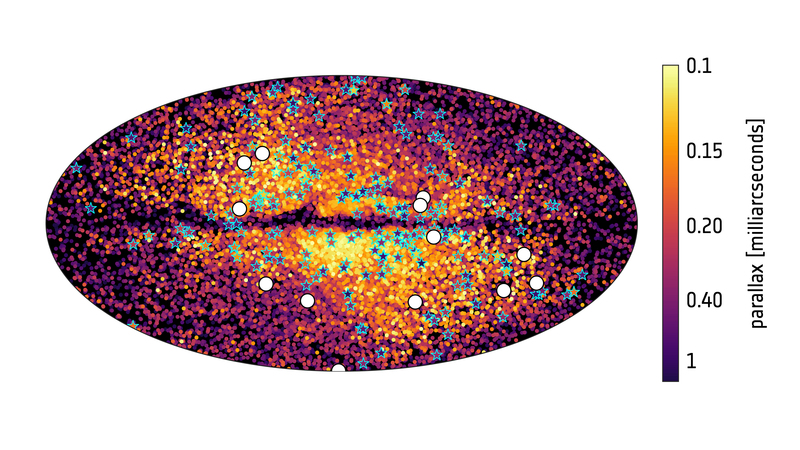 All-sky distribution of an 'odd collection' of stars detected in the second data release of ESA's Gaia mission. These stars move along elongated trajectories in the opposite direction to the majority of our Milky Way's other hundred billion stars and have a markedly different chemical composition, indicating that they belong to a clearly distinct stellar population. From these clues, astronomers inferred that these stars are the debris of a galaxy that merged with our Milky Way during its early formation stages, 10 billion years ago, and named this galaxy Gaia-Enceladus. The stars of Gaia-Enceladus are represented with different colours depending on their parallax – a measure of their distance – with purple hues indicating the most nearby stars and yellow hues the most distant ones. White circles indicate globular clusters that were observed to follow similar trajectories as the stars from Gaia-Enceladus, indicating that they were originally part of that system; cyan star symbols indicate variable stars that are also associated as Gaia-Enceladus debris. Corrigendum: The colour bar label in the original image previously referred to "microarcseconds". This has now been corrected to "milliarcseconds".